Finding a good deal on vacation packages is, let’s just say, can be a hassle. 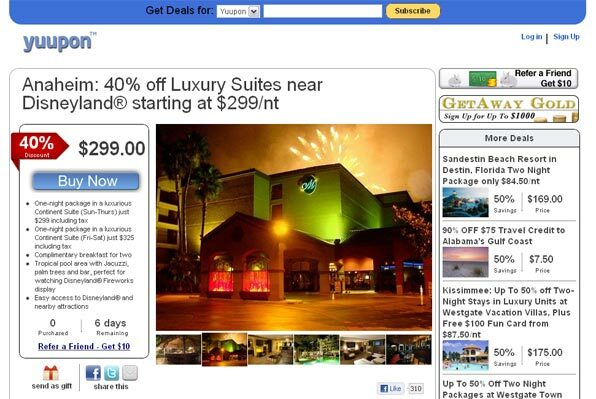 Websites like LivingSocial and Groupon offer good deals on a daily basis and one can also find great deals on Twitter. A new site launched today – Yuupon.com – offers upto 20 deals each week, each of 40% to 90% off and with flexible dates. The deals will range from mid-priced offerings to the high end packages. Users have up to seven days to decide on a package and can then book it with the date open for future selection. The trips are even transferable. Even after purchase and payment, one can get a full cash refund in 8 days. After that time, a credit for a future trip will be given in lieu of cash back. Simply request cancellation before the date listed on the voucher. Yuupon will initially focus on travel deals within the U.S. and then branch out with offerings in the Caribbean and Mexico. No ad campaigns but you can win from $10 to $1,000 in “Getaway Gold” just for signing up. To earn even more “Getaway Gold,” like them on Facebook or tweet about them on Twitter. During its launch period, Yuupon will put more than $1 million in random increments from $10 to $1,000 in each opened account.